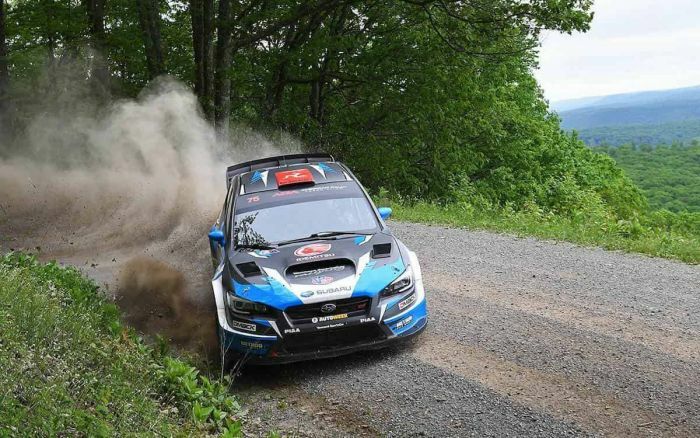 David Higgins and Craig Drew are very familiar with the Susquehannock Trail Performance Rally (STPR) and it paid off big. This past weekend in the 2018 Subaru WRX STI, they made history at the event. This makes the eighth time Higgins has won the event making him the winningest driver ever at STPR. Chris Atkinson and Stephane Prevot in the #55 WRX STI joined the team at STPR and it was their first time to see the stages. Atkinson knew early on that he wouldn’t be able to match the pace of Higgins and decided to get comfortable on the roads at a safe pace. Higgins knows the stages like the back of his hand and took advantage of his experience. Atkinson and Prevot still put down solid times and held a respectable second position overall for the entire afternoon until a minor mechanical issue caused the pair to relinquish their position to their competition. But it was privateer Barry McKenna and Leon Jordan in their 2011 Ford Fiesta who took the lead early on. Higgins and Drew got up to speed on stage 8, and put down an impressive time, besting Atkinson and Prevot by more than 40 seconds, and Barry McKenna by more than a minute. Higgins and Drew closed the gap between them and rally leaders McKenna and Jordan. Then on stage 9, McKenna suffered a rally-ending off. The #75 WRX STI of David Higgins and Craig Drew set down consistently quick stage times for the remainder of the rally and took the #1 position on the podium. Higgins was sidelined at the seasons first Olympus Rally in May, but with the STPR win, leads the 2018 American Rally Association Championship once again. The next event, the New England Forest Rally (NEFR), takes place July 20-21. Stay tuned.